Soon Kueh, literally meaning bamboo cake in Teochew, is a very popular snack back in Singapore. 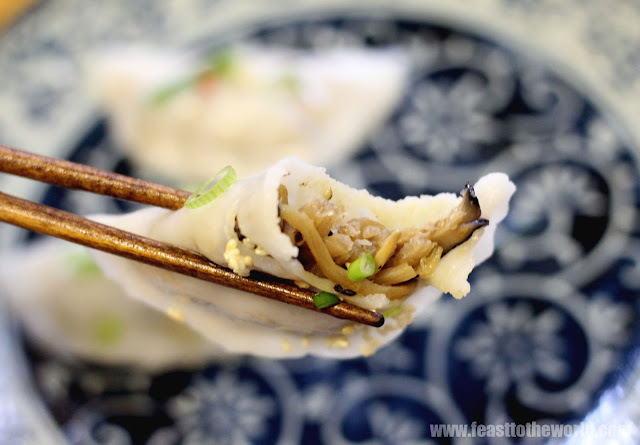 Traditionally, these are made with bamboo shoots, bangkwang (also known as yam bean/jicama or Mexican turnip), shiitake mushroom and dried shrimps. Disappointingly, many hawker vendors tends not to include Soon or bamboo, in their filings these days but the best stall will as the addition of the bamboo shoot gives a subtle sweetness, therefore much better flavours. This is one of my favourite snacks back in my teenage years and something that I would often made a special detour after school to my favourite stall just to buy a handful of these and then munch through them on the way home. It was a good hour and a half's journey and yet, that had never stopped me from accomplishing the mammoth trek just to cater to my personal indulgence. 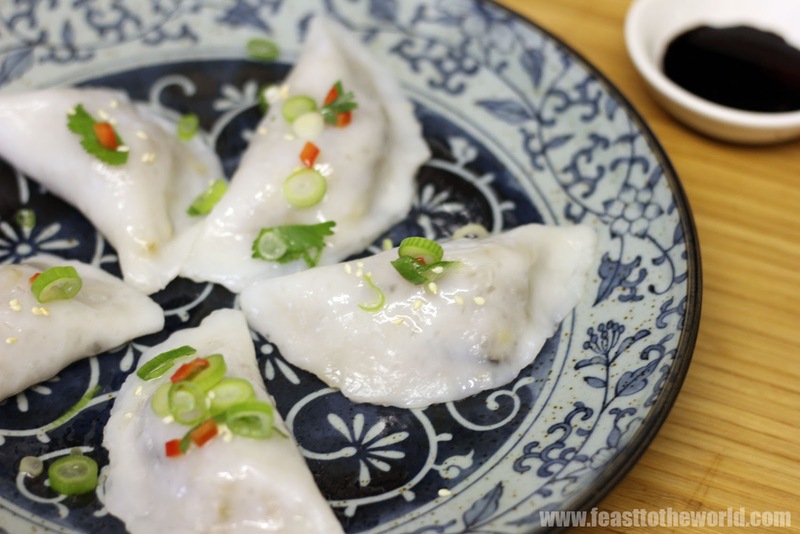 However, ever since I left Singapore, I had less opportunity to fulfilled my cravings for these beautiful delicate parcels which is why I had to resort to making this myself often in order to satisfy my own gluttonous desires. This recipe will yield about 30 parcels which might look a lot but trust me, they are so moreish that you will find them dwindling in numbers as soon as they comes out of the steamer. If by pure luck that you still have some leftover, they are absolutely delicious lightly pan-fried the following day for a crispy and delightful snack, top with a dollop of good chilli sauce. My favourite will be with some Nyonya Sambal chilli for that extra spicy kick. So good! Prepare the filling. Drain the mushroom, remove the tough stalk and thinly sliced. Drain the dried shrimps and roughly chopped. Heat the oil in a wok over medium heat. When smoking, add the shallots, garlic and dried shrimps and stir fry for 30 seconds, until fragrant. Add the mushrooms and yam bean and cook for another 3-4 minutes before adding the bamboo shoots, followed by the rice wine, soy sauce, sugar, stock or water and season with salt and pepper to taste. Continue to cook for another 3-4 minutes, until the yam bean is tender and the mixture is almost dry. Remove and set aside to cool. Bring the water to the boil. Meanwhile, sift the rice flour and tapioca starch into a large mixing bowl. Pour the boiling water into the flour mixture and stir to mix well with a spatula or wooden spoon until smooth. Lightly dust a work surface with some rice flour, turn the dough onto the work surface. Make a depression on the dough and pour in the oil. Knead well to incorporate the oil into the dough. Cover the dough and rest for 10 minutes. 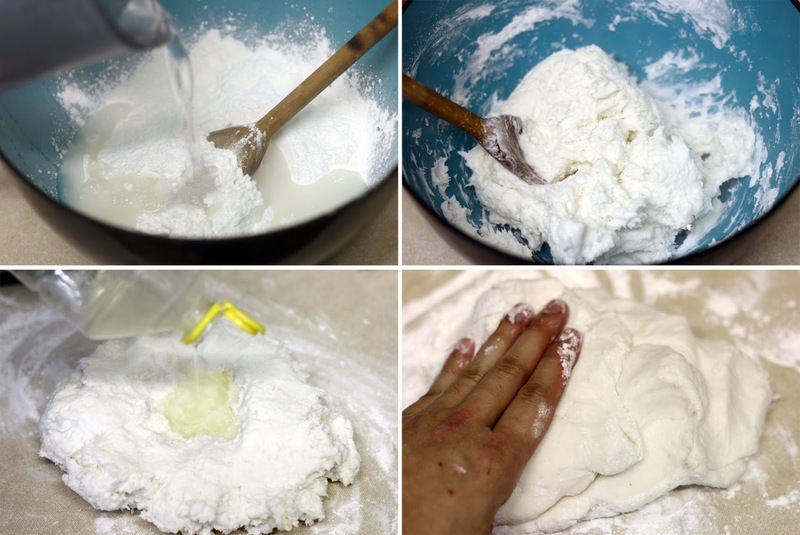 With damp hands, knead the dough until smooth and pliable. Divide the dough into 28-20 equal portions and cover them with a clean, damp tea towel to prevent them fro drying out while you start forming the little parcels. Lightly dust the work surface and roll each portion into a thin circle, roughly 10 cm in diameter and 1-2 mm thick. Trim with a cookie cutter if you want a perfect circle. 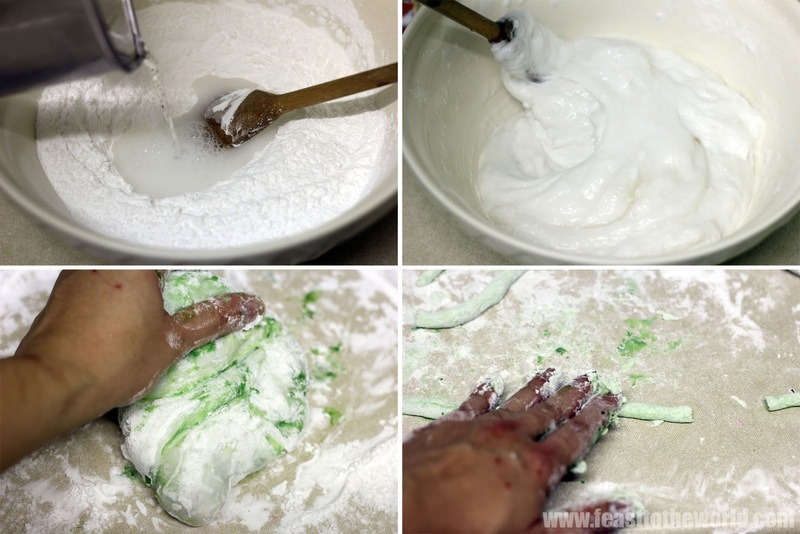 Place 1-2 tablespoons of filling onto the centre of the dough circle. Fold the circle in half to enclose the filling. Press on the edges to seal well. 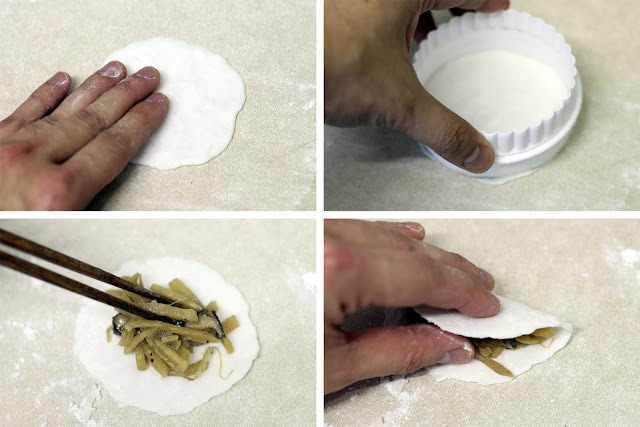 If they don't adhere, mix some rice flour with a bit of water into a paste and use this as an adhesive to seal. Repeat with the remaining dough and fillings. Prepare the steamer. Lightly brush the steaming tray with some oil and arrange the soon kueh on it, space slightly apart. Stream for 10-12 minutes, until the dough turn slightly translucent and the soon kueh are cooked through. Do not overcrowd the steamer and do this in batches so the soon kueh can cook evenly. 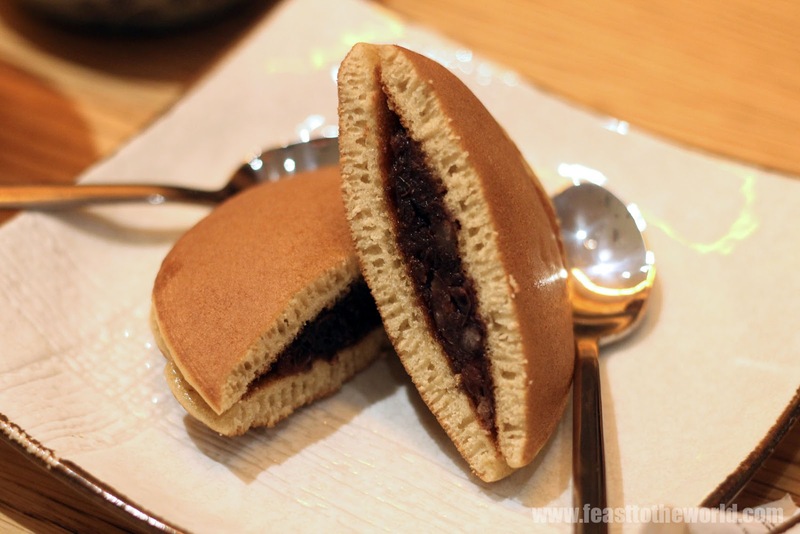 Once cooked, brush the surface of the soon kueh with some oil to prevent them from sticking. 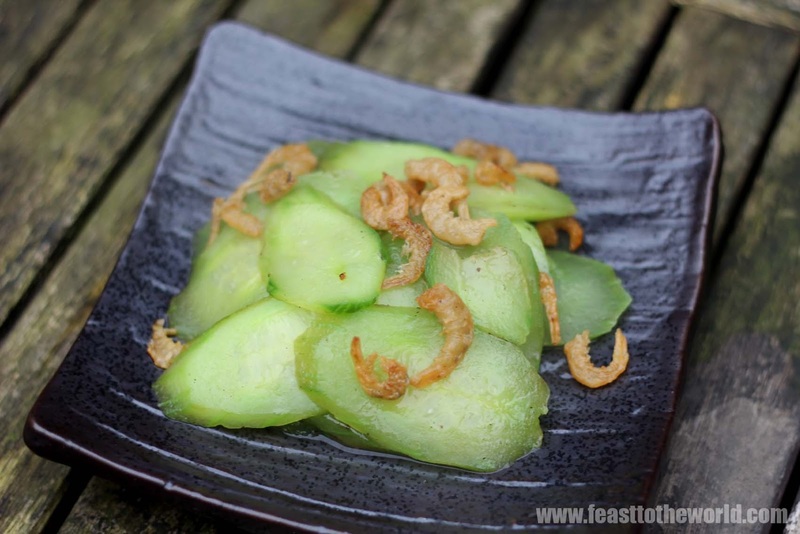 Transfer onto a serving dish and garnish with the spring onion and chillies if using. Serve warm with the sweet flour sauce and chill sauce on the side. Bubor Cha Cha, the very mention of it would trigger a snigger or two. Is it a dance? I was asked by those who suffered from childhood depreviation of this legendary Nyonya pudding. Oh I do feel sorry for them lost soul who doesn't know the good of it. No it's not a dance fool! You might be confusing it with the popular cuban Cha-Cha-Cha dance but make no mistake, a dance it is most certainly not. I know we Peranakan are famous for the arrays of delicate Nyonya kuih that requires the agility of a master contortionist to twist and bend the dough into multi-colours and drool-inducing cakes but to me, this simple pudding is all it takes to transport me back to my childhood. Although preparing this beautiful pudding is time consuming but the end result is most definitely worth it. The most labour intensive part of this is the making of the tapioca/sago jewels but these days, you can easily get them ready made from any good Chinese supermarket which will save you some time. All they requires then is to simply drop them into boiling water to cook them and Bob's your uncle. However, for me, the best memories of this was the making of these coloured jewels with my nan. With my tiny hands stained in an eclectic mix of red, blue and green, tiny pieces of coloured dough would be magically transformed into bright, glorious gem stones. 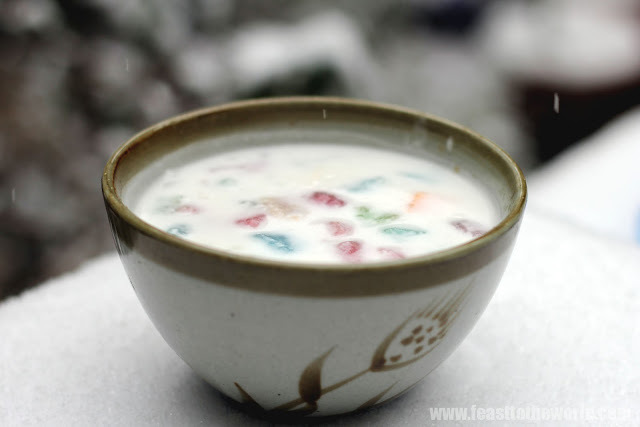 With the recent sudden spell of heavy snowfall that is blanketing the whole of London, what could be better than to have a bowl of these warming and comforting Bubor Cha Cha to get you through the freezing cold weather. Peel the sweet potato and yam. Cut into 1 cm cubes. Prepare a steamer and steam the cubes for 15 minutes until they are cooked. Do this in batches if necessary. Set aside. To make the tapioca/sago jewels, sift the tapioca flour into a large bowl. Add about 5-6 tablespoon of cold water and mix well with a spatula or wooden spoon to form a fine paste. Bring the rest of the water to the boil in a pan. Pour in about 80-120ml (depending on the absorbent of the flour) of boiling water to the flour paste until it changes texture and colour and turn onto a thick, opaque paste. Continue to mix well to remove any lumps. Replace the pan back onto the heat and allow it to boil gently. Lightly dust the work surface with some tapioca flour and transfer the thick paste onto this. Divide int three potions. Add enough colouring to each portion to turn then into red, blue and green. Roll each portion into long strips, roughly about 1cm diameter. Cut the strip into 1 cm squares (it doesn't matter if it's not perfect). Turn up the heat and bring the simmering water to a rapid boil, adding more water if necessary. 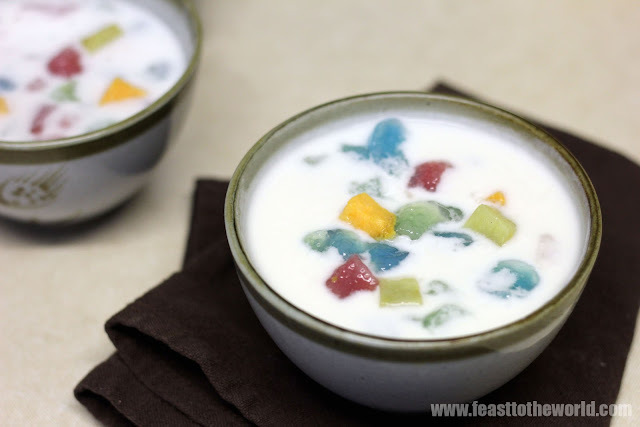 Drop in the tapioca squares and cook them in batches. They are done when they risen to the top. 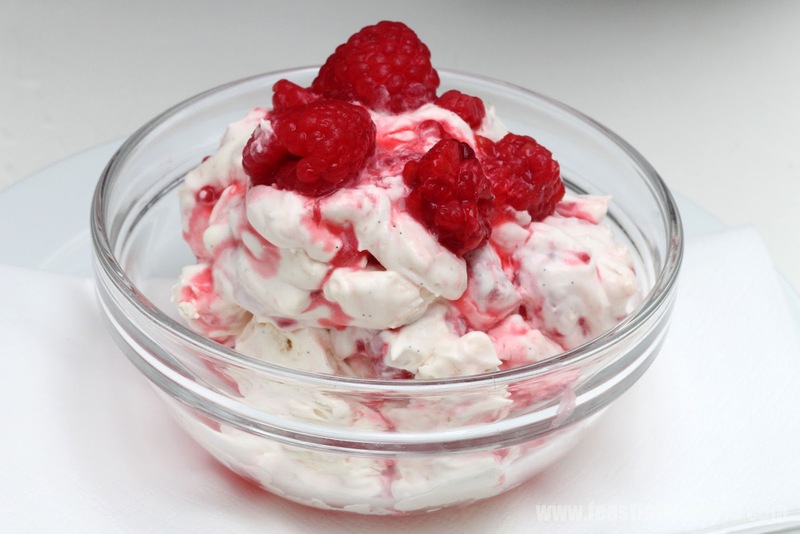 Remove with a slotted spoon and plunge them into a large bowl of cold water to prevent them from sticking together. To serve it chill, combine the yam, sweet potato, tapioca jewels and coconut and chilled in the fridge for a few hours before serving. 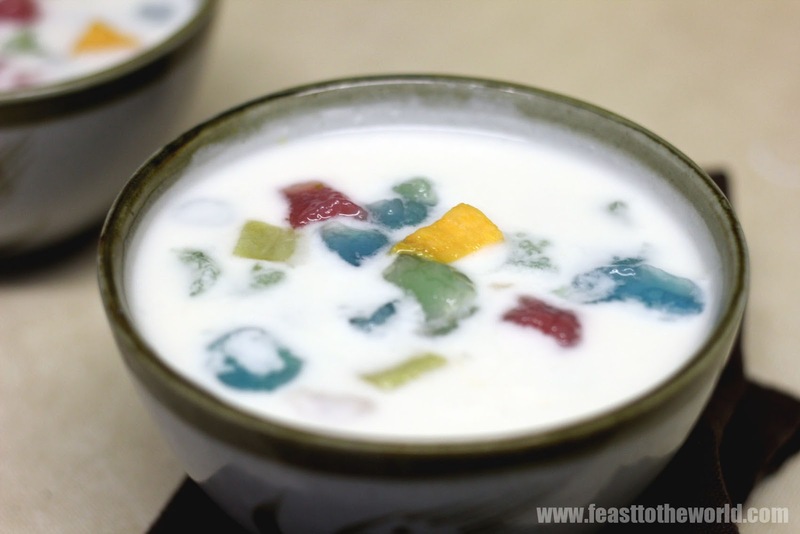 Alternatively, gently warm up the coconut milk over medium-low heat and add the bits to this before ladling the bubor cha cha into individual serving bowls. And this brings me nicely to Shoryu Ramen. A quick background of this joint. This newly open ramen restaurant is an offshoot of Japan Centre. 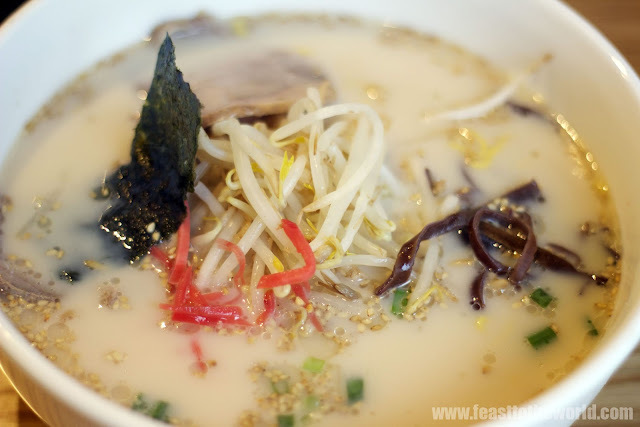 The chef originated from Hakata, Tonkotsu capital, and that is precisely what they proclaims to be serving here. 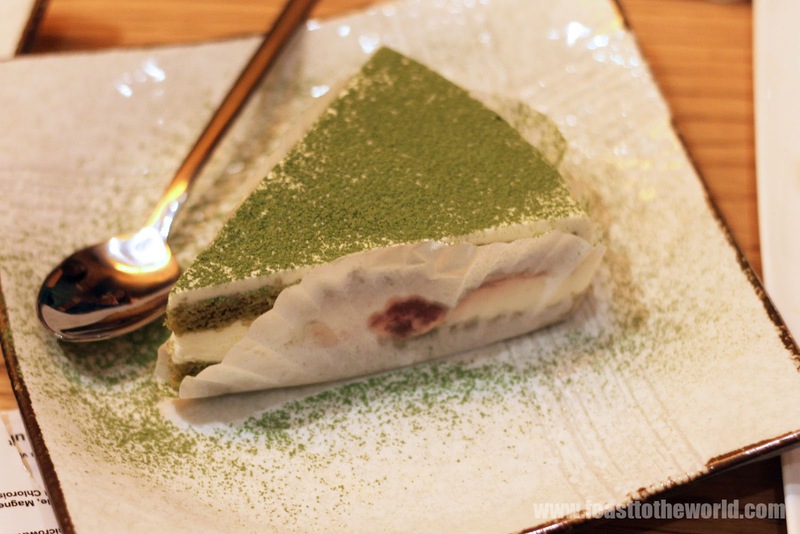 I first visited them during the soft opening week, making full use of their 50% off offers. On the menu, there was a huge selection of ramen on offer but almost without any hesitation, the original Hakata Tonkotsu (£8.90) was what I went straight for. When it arrived, I was dissapointed by what I saw....no Nitamago(seasoned egg) ??! I had to place an additional side order of these and what arrived was equally disappointing - overcooked eggs. Begrudgingly, I start slurping my bowl of steamy noodle. The milky broth was a tad too gingery for my liking, and that it overpowered the otherwise rich and porky broth. There was depth of flavours within which just seemed unfortunate to be masked by the taste of the ginger. The wrong noodles were used and the bouncy strands became a bit too heavy when paired with the collagen and fat laden white broth. And sadly, I didn't like the Chashu either, the used of lean pork yielded slices of dry, chewy meat. So all in all, disappointing toppings aside, it was quite a relatively good bowl of Tonkotsu. The good news is, unlike most restaurant, the chef behind this ramen joint actually paid attention and listened to customers feedbacks. As apparently, I wasn't the only one disappointed by the ramen. Taking in all the constructive criticisms, they continuously to evolve their offerings. 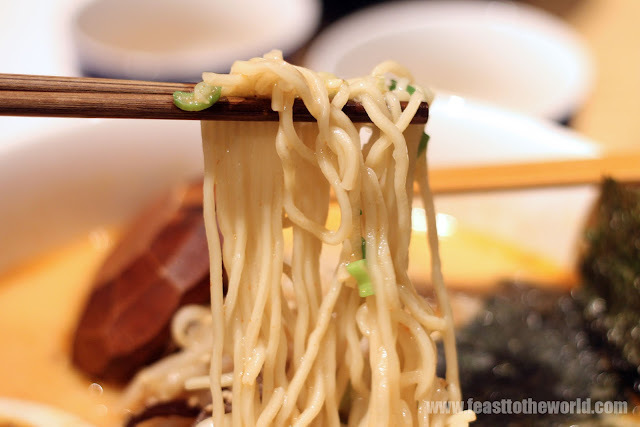 Over the past month since they opened, they replace the noodles with the proper leaner and straighter Hosomen; added Nitamago to every bowl of ramen and using fattier cut of pork. I was rather excited again, when I decided to return to sample their newly improved ramen along with some of my other foodie friends. The menu appeared to be even more elaborate, there was a whopping 13 ramen options. I went for the Piri-Piri Tonkotsu (£9.90) with an extra portion of Charshu (£2). The ramen arrived, this time round looking much more complete with the soft-boiled Nitamago. The broth retained that rich umami but with a good spicy kick which I enjoyed. 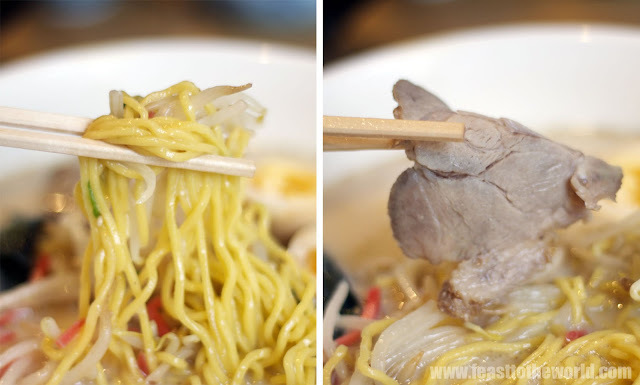 The pork were meltingly tender, just how it should be and the hosomen noodle glide straight up my mouth as I quietly slurped away. My fellow dinner, Kavey offered me some of her Karaka Tan Tan Tonkotsu (£9.90) which came with pan fried mince pork topping. 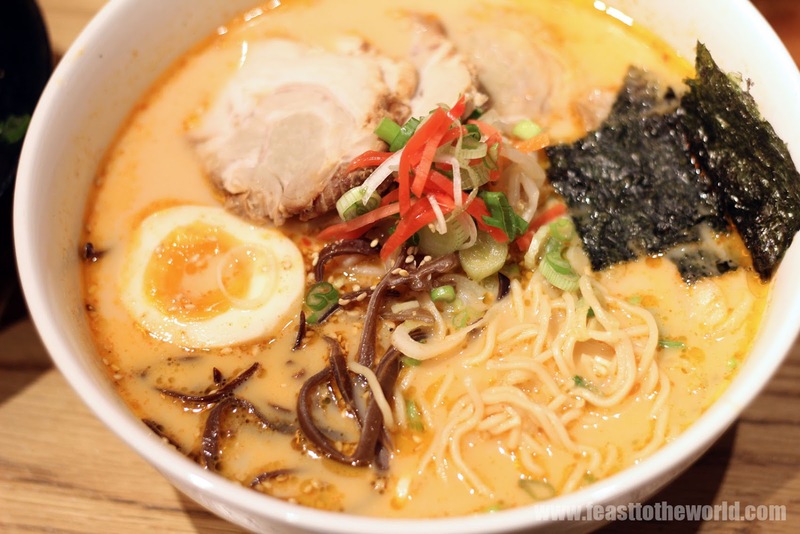 Still good but although I must say, I prefer the spicier version as I just think that for their original Tonkotsu base, I couldn't help but comparing it to the richer broth which I am so addicted to over at Bone Daddies. As for the sides, there were a few that stood out. 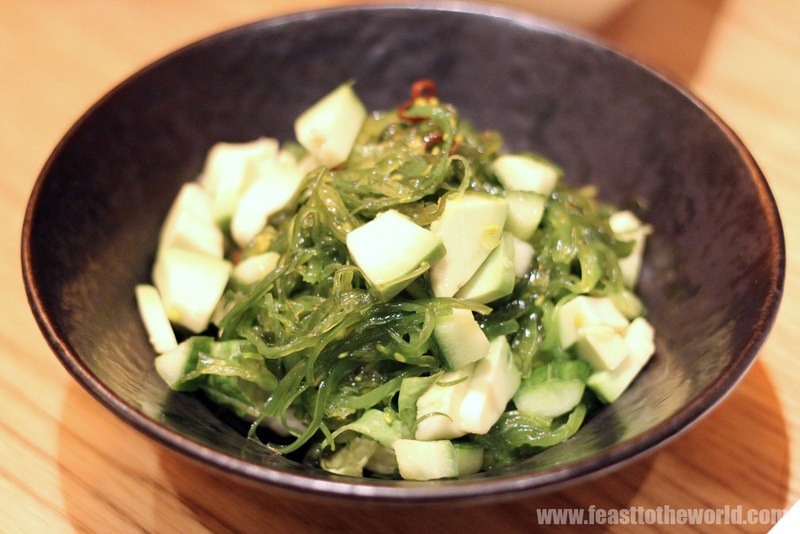 The wakame salad was light, refreshing and crunchy. The hint of chilli kick were a nice little surprise. The Shishito peppers was another delight. 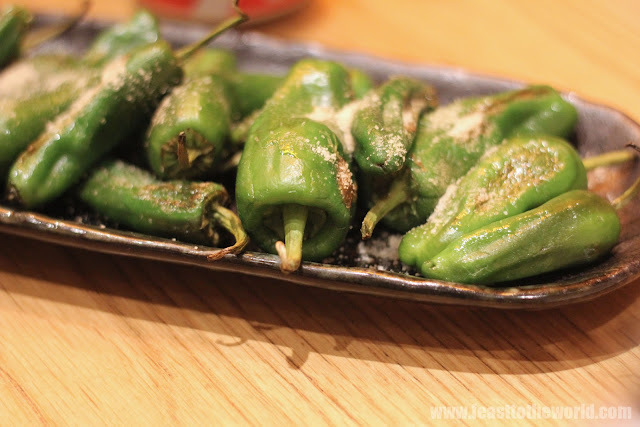 Roasted with yuzu and sea salt, the fingers-size chilli were quite moreish. 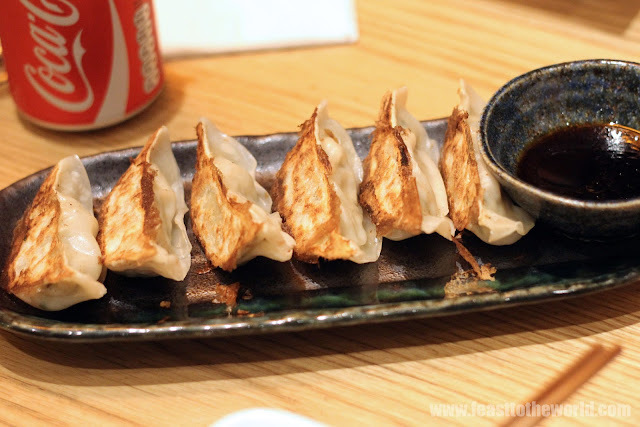 The prok gyoza were stuffed full of filling which was good but a tad underseason for me, although it was still one of the few better ones that I have tasted. The puddings too were thoroughly enjoyable. So how does Shoryu fair in my inner ramen richter scale, to cut the long story short, I like it. It's good and price-wise, it's most definitely the cheapest. However, personally I would pay more for better toppings and way superior Tonkotsu over at Bone Daddies but that is not to say that I have strike Shoryu off my radar completely. 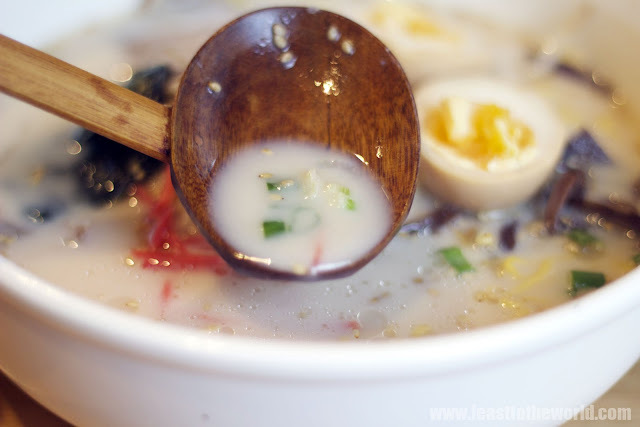 After all, they do serve a stonkingly good bowl of ramen! Slurp......! These days, it seems like everyone is an expert in stir frying, main culprits being the celebrity/TV chef and this makes me mad. Not that there is any thing wrong with that. 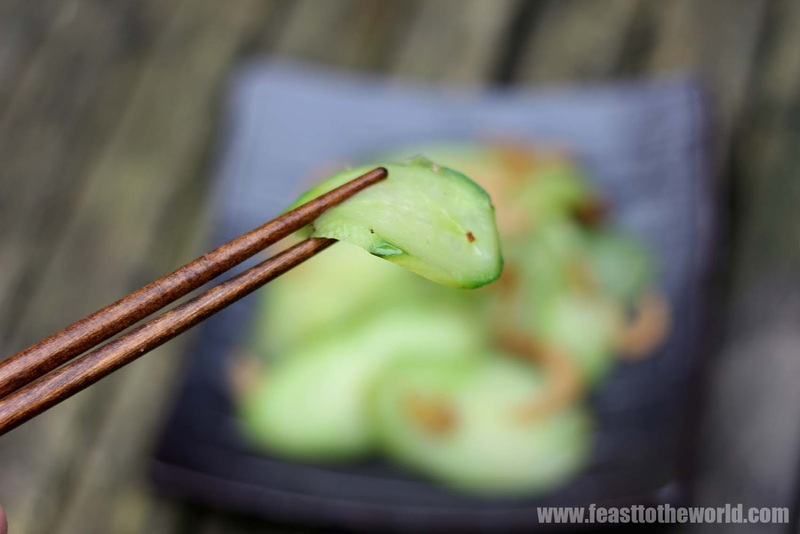 After all, the popularising of Chinese cuisine is nothing but a good thing. But I do sometimes wish that they would spend a bit more effort, conducting more research into the true art of Stir Fry. 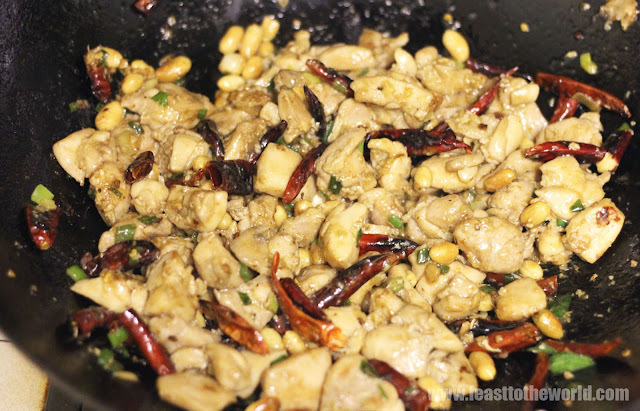 Just by tossing everything in a pan and Bob's your uncle DOES NOT makes it a Chinese stir fry. Fair enough that not every domestic kitchen can afford to turn up the heat so high that they risk either setting the house on fire or worse, losing their eyebrows (we still have to face the world the following day). Anyhow with all the ceramic stoves available, the 'Wok Hei' or breath of the wok that is so important in a good stir fry is virtually impossible to attain. 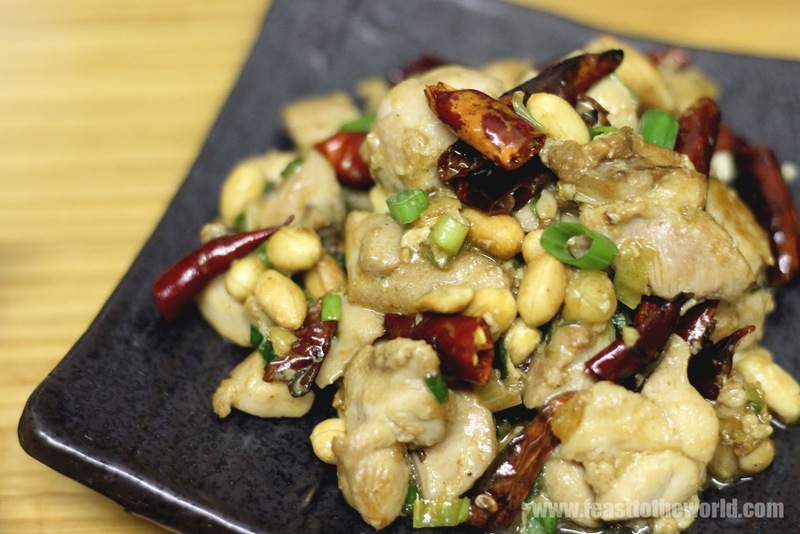 But that is not to say that we have to neglect the rest of the basics that attribute to this famous style of cooking from the Chinese culinary world. Here are some example of this travesty. First and foremost - the wok, without which a good stir fry is almost certainly bound to fail. 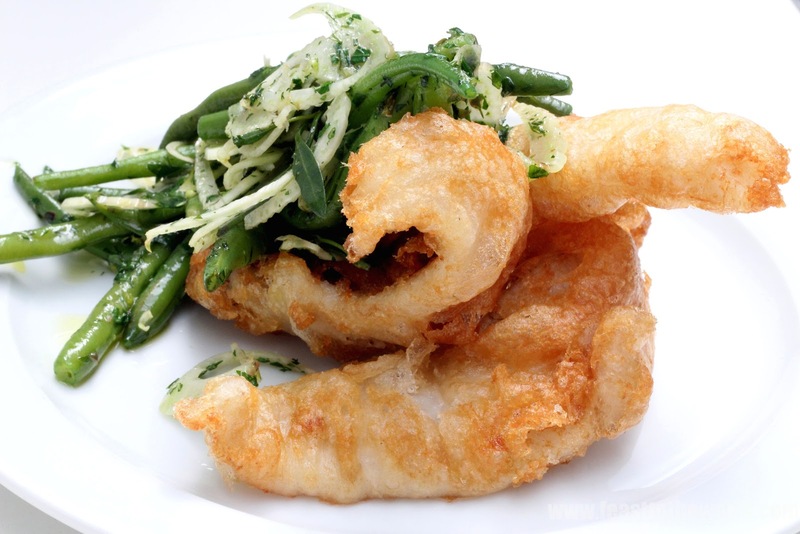 You can of course use a large frying pan instead but the results will not be the same. And I'm not talking about those fancy, expensive non-stick wok. A good wok should be made from simple carbon steel which can be bought cheaply from any good Chinese supermarket. Once properly seasoned, this curved vessel will allow you to scoop, toss and stir yourself into genuine stir fry heaven. By season, I do not mean laden it with salt and pepper. You first scrub your new wok with a metal mesh scrubber to get rid of the protective coating applied by the manufacturer. Then you dry it and then heat the empty wok over low heat until smoking. 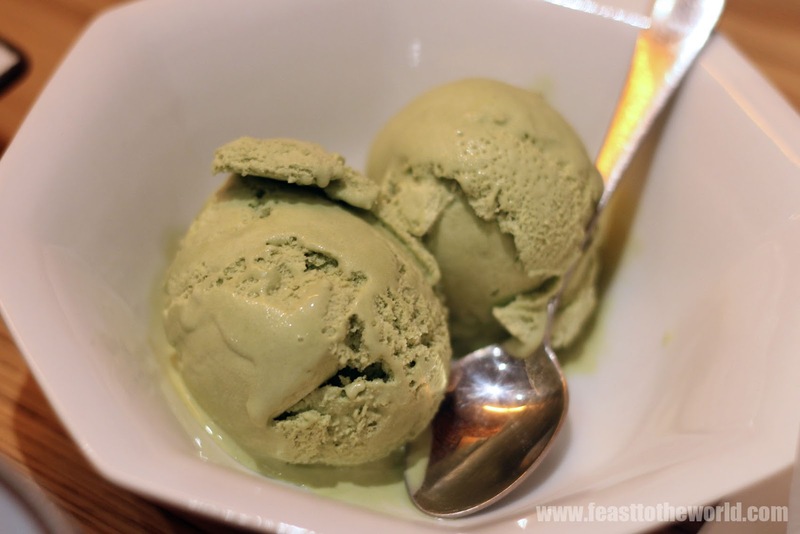 This helps to burn off any excess coating. Gradually, the wok will start to turn a deep brown colour. Remove from heat, brush with a thin layer of cooking oil and place back onto the heat for another 10 minutes or so until the wok completely changes into this dark brown, almost black tinge. Remove and give it a good clean with a sponge and some warm water. Never clean you seasoned wok with soap. Wipe dry and then brush with a thin layer of oil before storing. Your wok is now 'seasoned'. Woo-hoo! Then there the actual stir frying. Always make sure to heat the wok first until it is smoking before adding the oil. This prevent the food from sticking. The velveting technique is another process that is almost neglected by all. 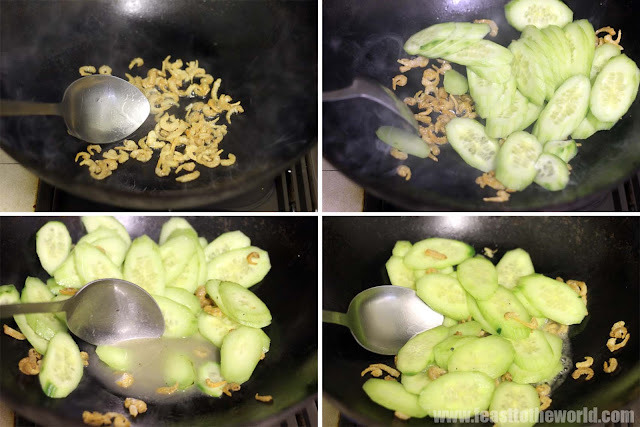 Maybe its due to health issues as this uses an eyes-popping, jaws-dropping amount of oil but this plays a crucial part in resulting a successful stir fry. And to be honest, you are not going to consume all the oil used for this as most will be drained away. A good alternative is to 'velvet' the marinated meat by blanching them quickly in boiling water but this works better with seafood. 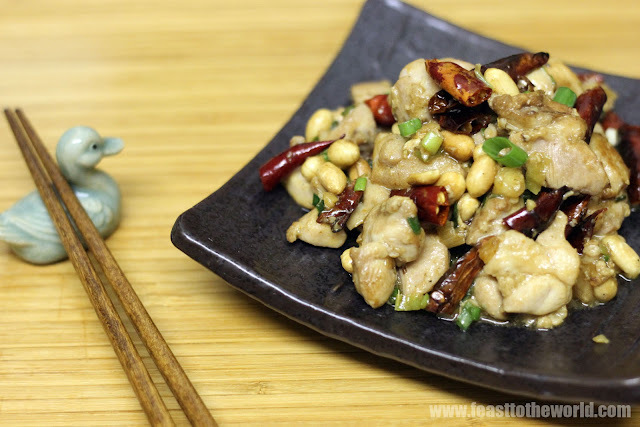 And to demonstrate this, I have made a classic Szechuan dish, Gong Bao or Kung Pao Chicken. 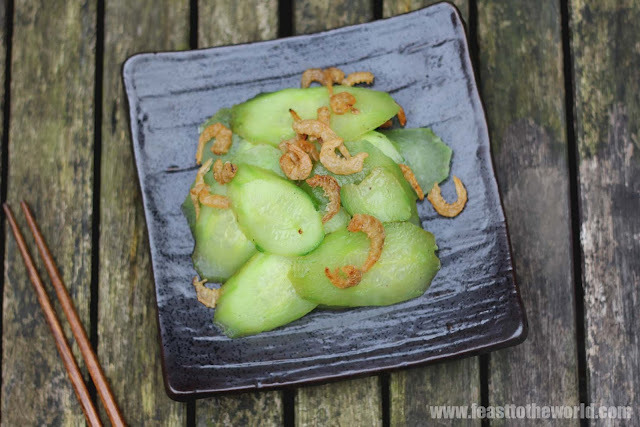 This vastly popular dish appears in almost every Chinese restaurant and takeaways yet it is one that often disappoint. Most fails to execute the laborious velveting technique thereby yielding some dry and chewy chicken. 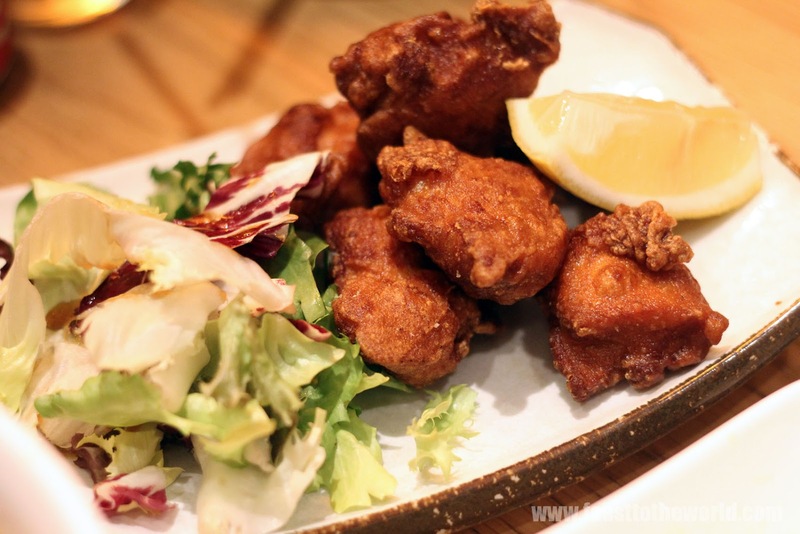 If you've ever had a good meal in a Chinese restaurant and often find yourself wondering how on earth did they managed to produce such smooth and velvety chicken bites. Well, this is the secret. And if you ever choose to use breast instead of thigh for any future stir fry, you'll be surprise at the difference made by using this technique. In a bowl, add the chicken cubes with all the ingredients for the marinade and mix thoroughly. Leave to marinate for 20-30 minutes. To prepare the sauce, mix all the ingredients in a separate small bowl and set aside. For the velveting, heat up the oil in a hot wok over medium heat until smoking. Add the marinated chicken and quickly blanch them in the hot oil for about 30 seconds. Remove using a bamboo sieve and leave to drain on some kitchen paper to remove excess oil. Do this in batches if necessary. Pour away all the oil in the wok. Clean with a brush and place the wok back onto the heat and heat over high heat until smoking. Add the oil and swirl it round to coat the wok. 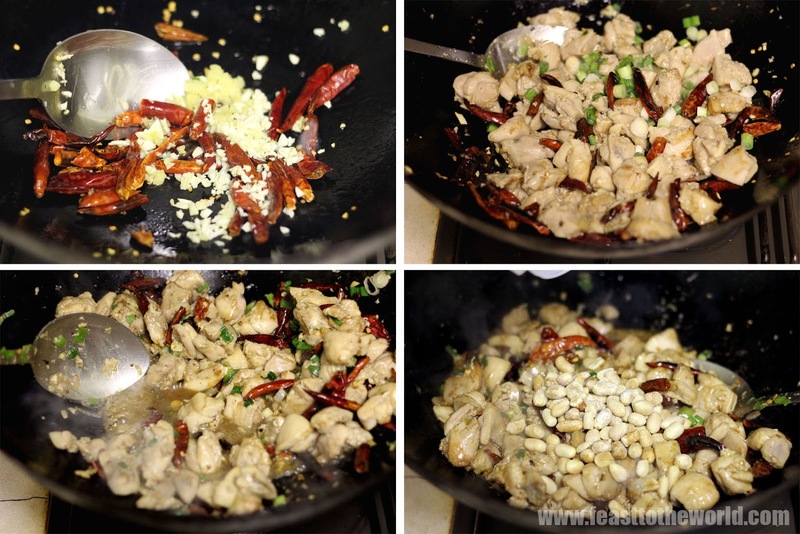 Add the dried chilli and Szechuan peppercorn and stir fry for 10 seconds, until fragrant before adding the garlic, ginger and stir fry for another 30 seconds, until they release their aroma. 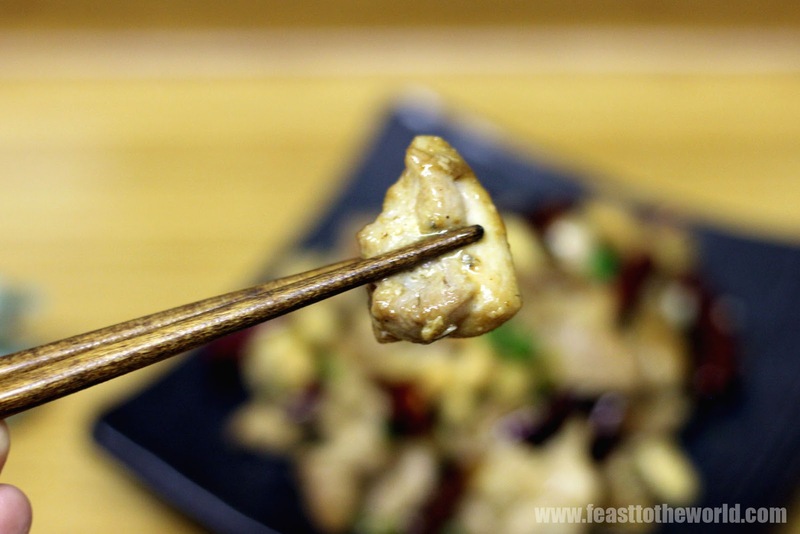 Add the velveted chicken and stir fry for 1 minute, using a scoop and toss action. Splash the rice wine around the side of the wok, stirring and tossing as you go along. Add the spring onions and continue to stir for another 30 seconds before giving the prepared sauce a good stir and add to the wok. Continue to stir and cook until the sauce began to thicken and coat the chicken thoroughly. 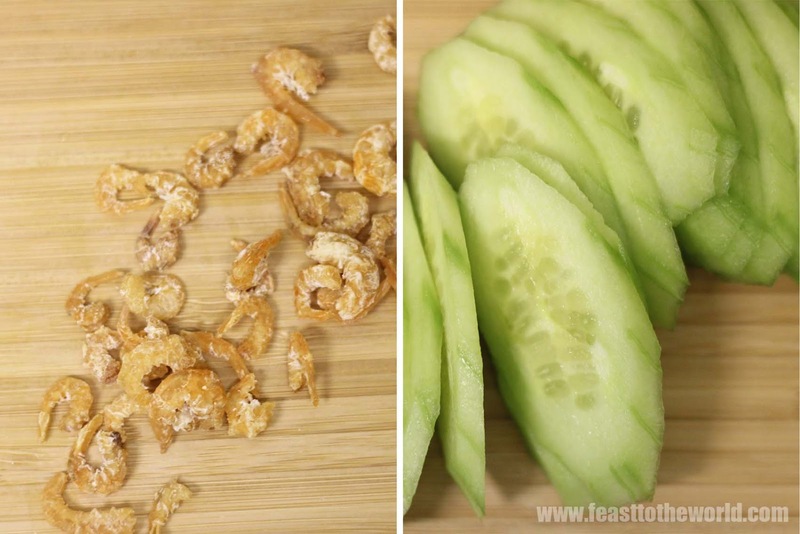 Scatter in the toasted peanut, give a good stir to mix and then remove to a serving dish. Serve immediately. Ba Shan is a Hunanese restaurant, serving genuine food that come from this region and that means only one thing to expect, Chilli and indeed, it did not skimped on that front. A red plague that proudly greeted the diners upon entering proclaimed, ' If you don't eat chilli, you won't be a revolutionary'. And rightly so! Situated only a stone throw away from the ever buzzing Chinatown, on a quiet corner street in Soho is this rather quaint little restaurant. With its Chinese teahouse facade and dark wood interior it exudes a certain elegance. The beautiful hanging lanterns and oriental-style furniture completes this vision. Dotted around are memorabilia of Chairman Mao, who originates from the Hunan province. On my various visits, the service were cold but not entirely unpleasant which is much more than I can say for the rather off-hand manager. On a recent visit, we were told that we have only one and an hour's dining time, in a rather abrupt tone before we were even shown to our table. But to be fair, we overstayed slightly and he did not chase us out with a broomstick. Although there were quite a few exchanges of scrutinising gaze from across the room. 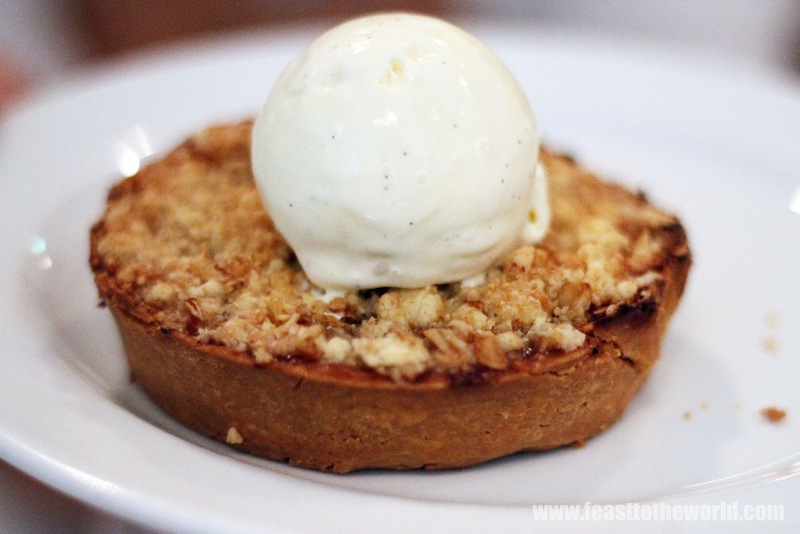 Despite the slightly underwhelming service, the food however, were excellent! The Preserved Duck Eggs with Chopped Salted Chillies 剁椒皮蛋 (£5.90) were surprisingly delicious. 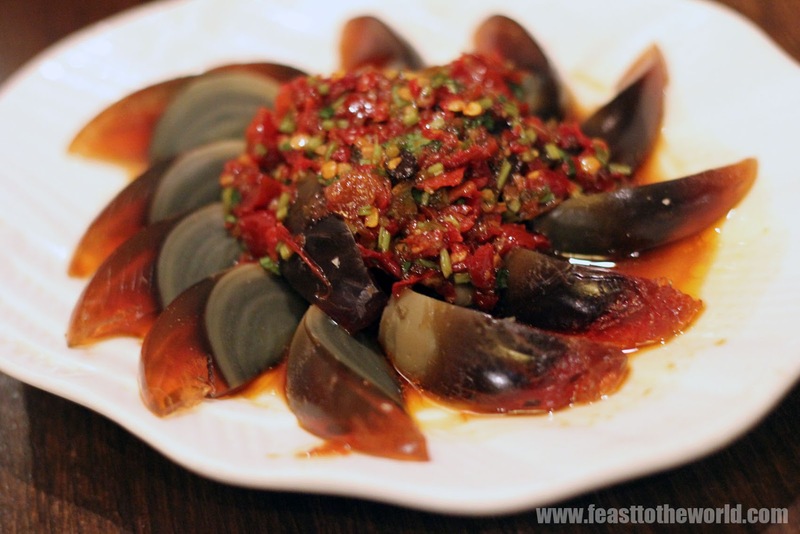 I was never a fan of these notorious gloomy looking century eggs when I was growing up but the few times that I have had them here were proofed to be an absolute treat. Served cold as appetisers, it had a crunchy yet gelatinous-like texture and the chilli kick paired very well and complemented the eggs. One of my favourite was the Pounded Aubergine 擂茄子 (£6.90). 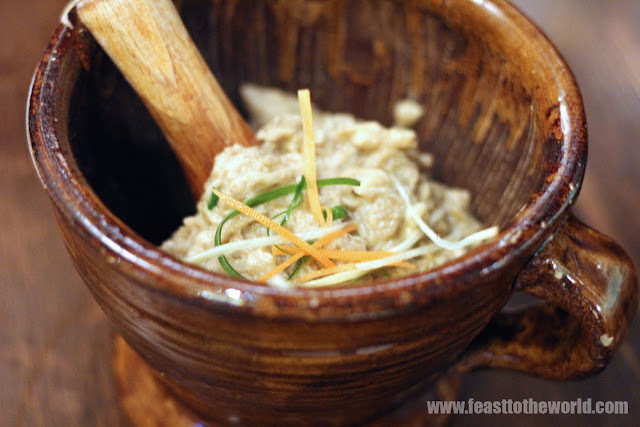 Mashed with sesame, garlic and chillies, it arrived in the mortar and pestle that it was pounded in. This cold appetiser were silky and moreish. The absolute must-have for any visits. The Bamboo-fragrant Chicken 竹香鸡 (£9.90) was these tiny chicken bites, buried in a vast amount of chillies and Szechwan peppercorn flowers. The tongue-numbing properties and chilli kick in this dish is of a higher calibre. The more you eat, the spicier it gets. It was utterly delicious, albeit a bit tricky to obtain the chicken from its fiery companions. Be prepared to munch through some of the chillies as you go along as I had....HOT! 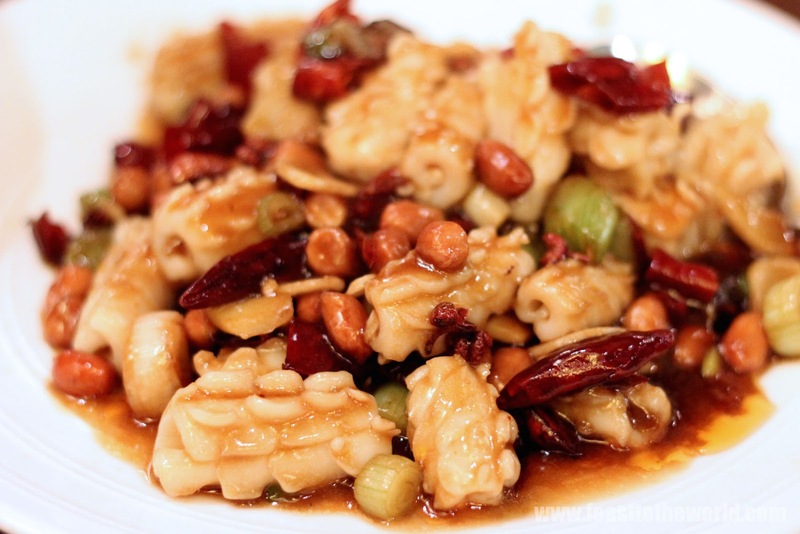 Gong Bao Squid with Peanuts 宫保墨鱼 (£9.90) was a huge disappointment for me. The classic sauce was far too sweet and the vinegar fragrant was overpowering. Although the squid were beautifully cooked, the lack of balance for the sauce just ruined this unfortunately. 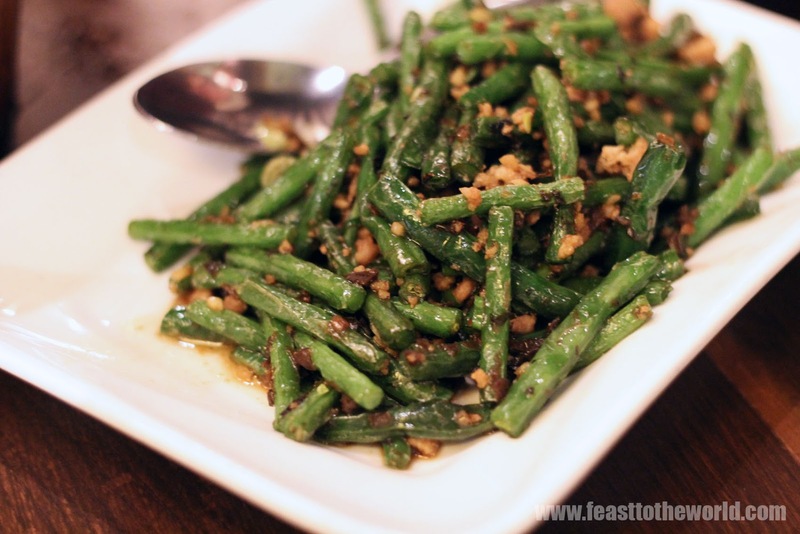 Dry Fried French Beans 干煸四季豆 (£6.90) on the other hand was a perfect classic dish. The beans were first deep-fried and then cooked with salty and spicy mince pork. Every bite let out that signature squeaky sound. 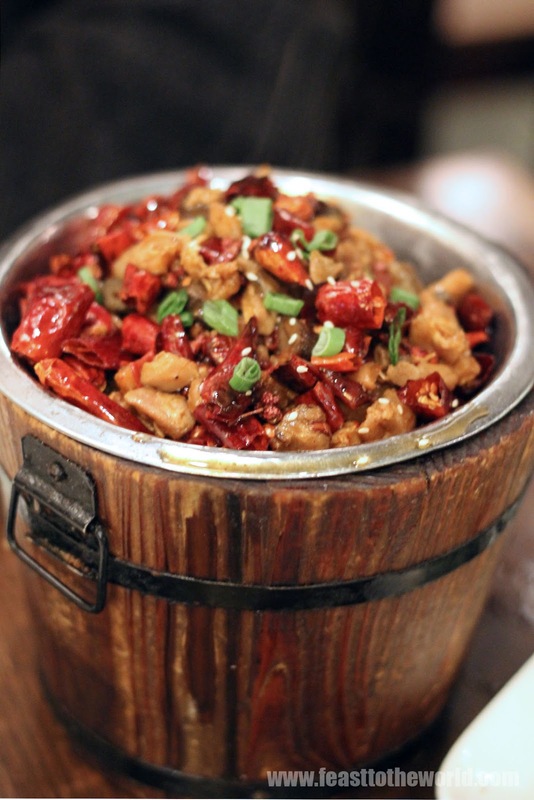 Another top dish that I must give mentioned was the Chairman Mao's Red Braised Pork 毛氏红烧肉 (£6.90) . Unfortunately I did not managed to take a picture of this as due to the yumminess look of this, it just somehow managed to disappear rather quickly before my very eyes and without even realising it, it was all gone! Damn my eager hands and those meltingly delicious pork! 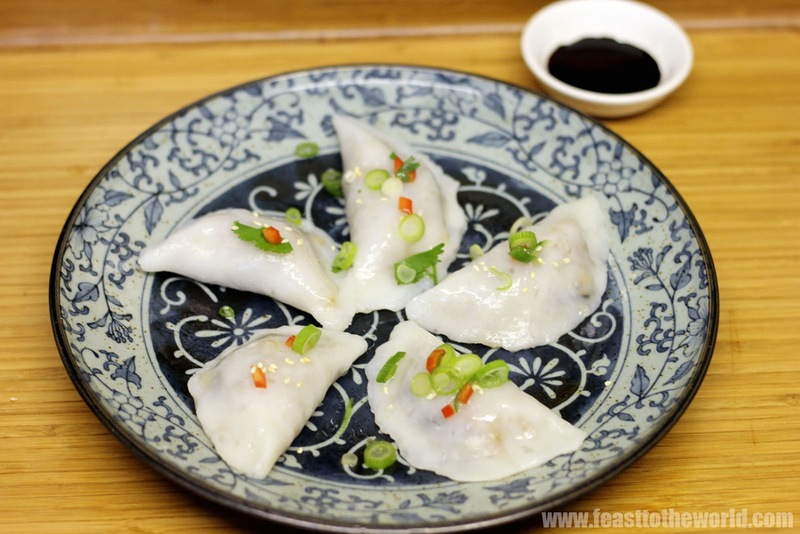 For those seeking a good Chinese restaurant, rather than submitting to the humdrum faire of those offerings in the nearby Chinatown, I will suggest you to take a few more steps to the nearby Romilly Street for this Hunan restaurant. It might not the cheapest around, but at least you can be certain that you are paying for a truly satisfying meal. Just make sure you order some plain steamed rice 白米饭 (£1.50) to counteract those fiery heat. During the year 2012 , I have been to quite a few superb establishment and one such restaurant is undoubtedly remain a firm favourite of mine - St. John Hotel . Sitting quietly between Chinatown and Leicester Square is this unassuming restaurant/hotel from the 'King of Offal' Fergus Henderson's growing empire. Over the year, I have been back a few times but for one reason or another I have never quite managed to write up a blog post. But upon hearing recent news about it going into liquidation and now the latest update is that it has been bought out by a Singapore businessman, I am determined to post a loving obituary about this wonderful restaurant. My first visit was with a few foodie friends of mine. 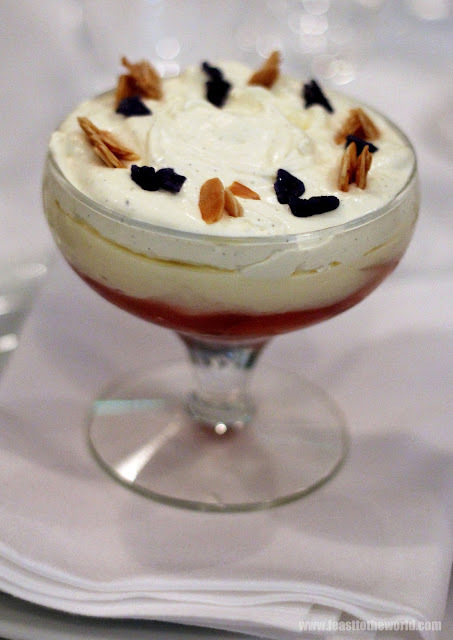 We have just been dining nearby in a rather disappointing venue where we refused to indulge ourselves any further in their pudding selection and so we all trotted along to St John's Hotel after hearing high accolades from my friend John who had been a few times. And so this 'pudding club quartet' made our decent into this rather cosy little dining room. The decor left very little to be desire. A simple boxed room, cramped with tables that were adorned with plain white tablecloths. Open kitchen at one end where there seemed to be an army of chef busy cooking away. My reservation however were quickly dismissed by an amiable Canadian waiter who served us with perfect hospitality. 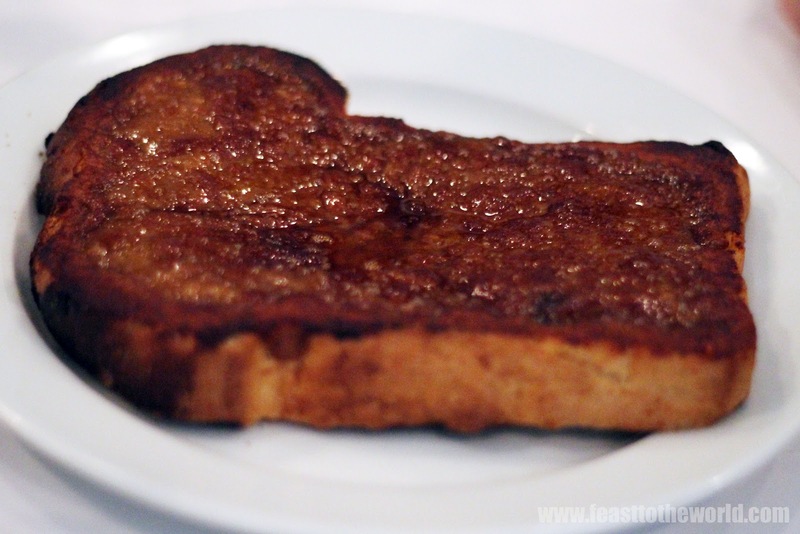 We shared the Welsh rarebit (£5.20) to begin with before we launch our assaults on the puddings. It was deceptively simple but had a hidden subtlety, with more depth of flavours than any rarebit I have had put together. It also had an unexpected but pleasant kick to it. 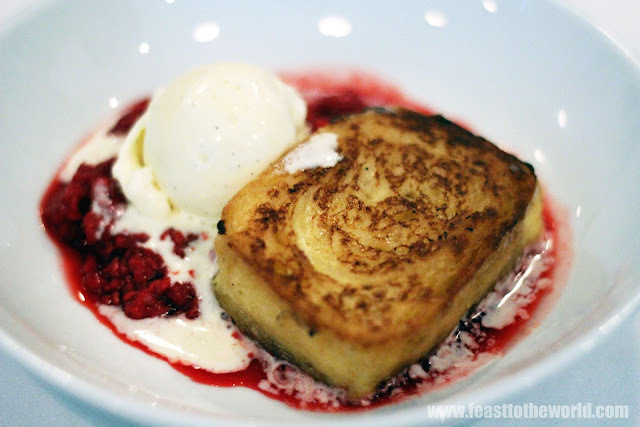 As for the puddings, all were superb, especially the poor knight's pudding - an retro toasted eggy brioche dessert served with some seasonal raspberries. It was light and as it soaked up the gradually melting vanilla ice cream, turned into this creamy sponge that was just so satisfying. 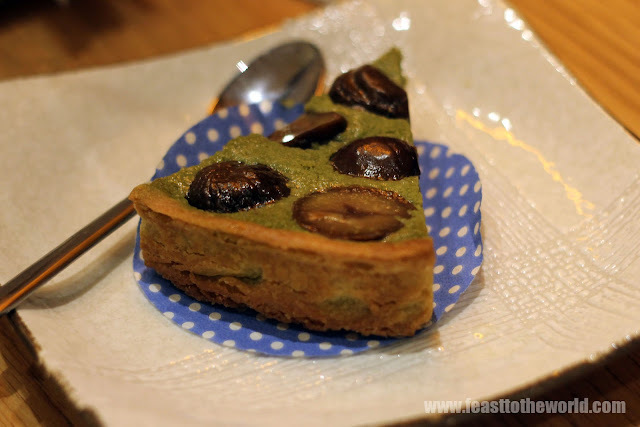 The Gooseberry tart too were sweet with a faint tartness. 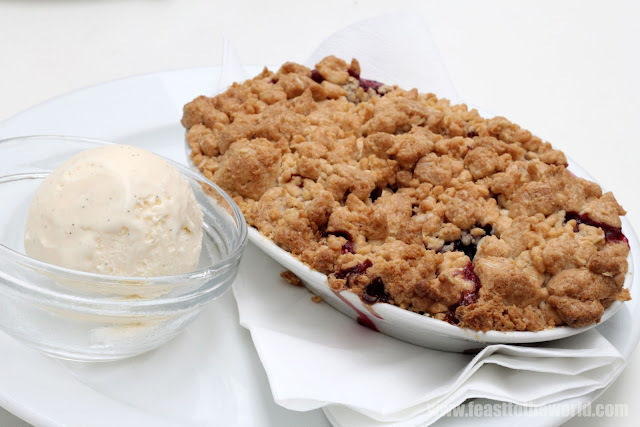 The rich and short pastry were perfect vessels to carry a bite size of these juicy fruits to the mouth, creating an utterly pleasing and comforting sensation. 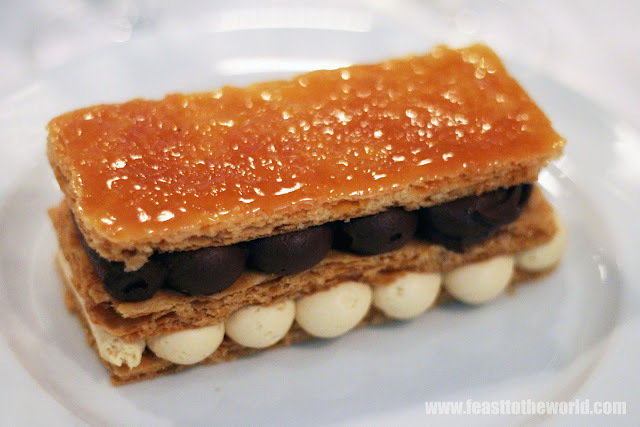 The weaker of the lot were perhaps the chocolate and caramel slice, the puff pastry could be a bit lighter and flakier, however, it did not distract from the fact that it was still very good. 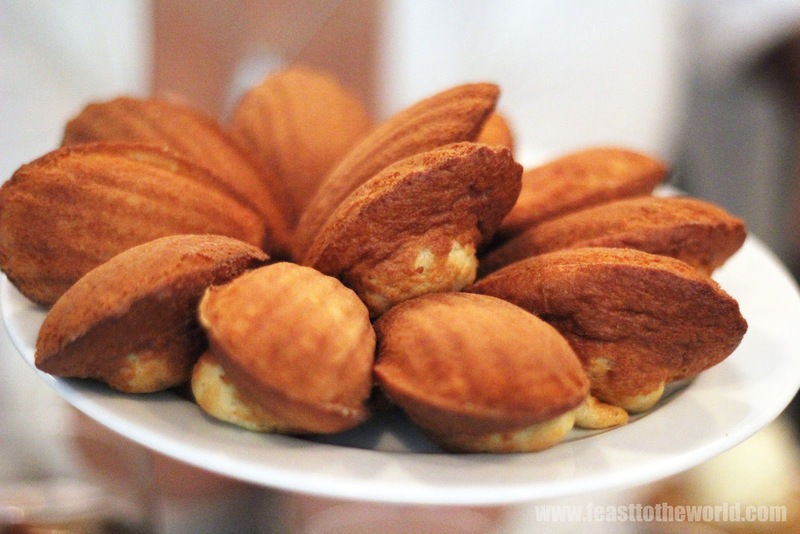 As for the Madeleine, Oh those Madeleine.....! Damn, those were good! Fresh from the oven, warm and still moist when bite into the delicate little shell-shaped cakes. So good.....so good! So now you might be wondering, the puddings were obviously top-notch but what about their savoury dishes? Well, I'll have you know, they were just as excellent. 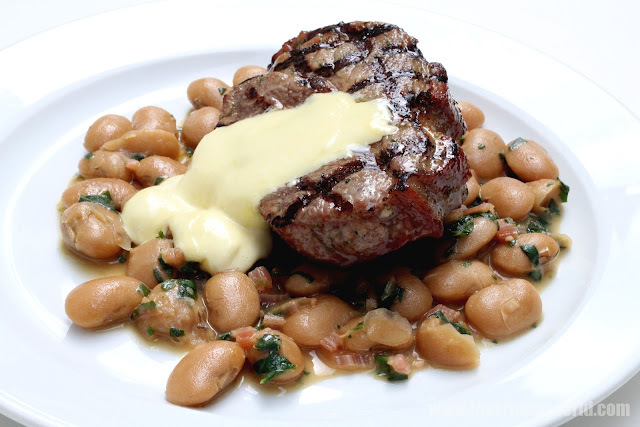 The followings are from their pre-theatre set menu, priced at £22.50 for 3 courses. 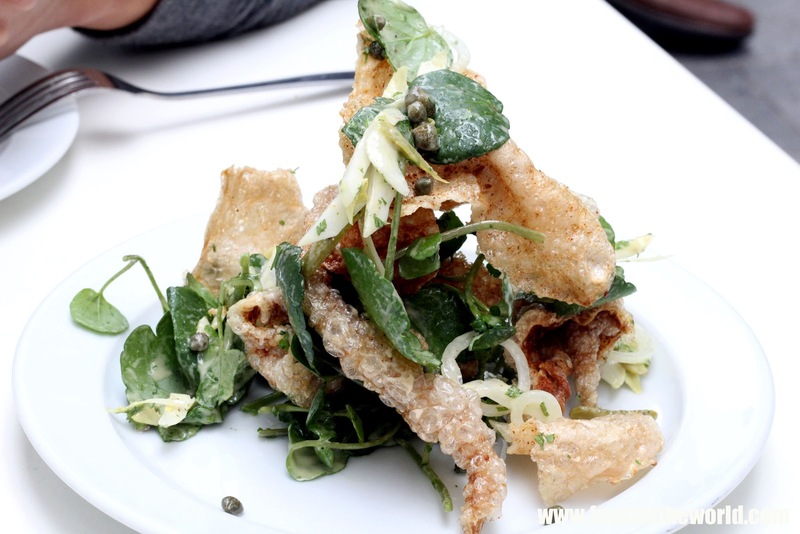 The devilled pig skins salad demonstrated one of the better use of this piece of crackling in a long while. Crispy and delicately spiced, the chilli kick cut though the sharp tangy dressing and the crunchy fennel and watercress provided a fresh balance to the entire dish. 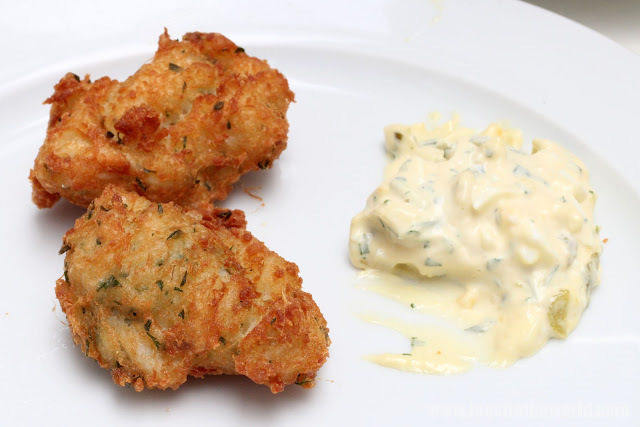 The salt cod fritters were light and deep-fried perfection. They were grease-free and so damn moreish. I had to share this with my friend Goz and I wish we would have the hindsight to order another plate of these, big mistake! Of all the mains, the stood out dish were the pork shoulder. It was beautifully grilled, with still that elusive pinkness that gave this piece of meat such tender bite. The knife glided across the meat effortlessly and once in the mouth, it just had this almost cream-like texture and packed full of porky-flavour. Never had I ever experienced such delicateness from a notoriously tough cut of meat. It was so good that I can still remember it to this day. Needless to say, the pudding were once again superb. Now we have come to the very sad end to this post. Due to the current bought out by a Singapore hotelier, the word on the street is that Fergus Henderson will no longer be involved in the running of this fantastic joint, and so soon after they've just been awarded their first Michelin star despite only been operating for a year! For now I would recommend anyone who has yet to patron this marvellous restaurant go as soon as possible. It will all change, for the good or bad I don't know, but one thing for certain, the magic touch from the genius himself will no longer be present. For any additional information on the future of St. John hotel, click on this link.